The general perception with the public regarding the extinction of the dinosaurs is that they were wiped out by a meteorite impact. This theory has inarguably become the most famous and highly publicized cause for the disappearance of the species 65 million years ago. Its popularity has caused it to be universally accepted as the only viable theory to explain the disappearance of the dinosaurs. In 1980, Luiz Alvarez, a Nobel prize winning physicists, teamed up with his son Walter, a geologist, and presented the meteorite impact theory. They had conducted research on clay layers found at the K/T boundary in the Umbrian Apennines (Gubbio section) in Northern Italy, and then matched their results to data from clay layers in New Zealand and Denmark. The Alvarez's research studied abundances of rare earth elements (REE) in the clay layer. They discovered anomalies for a few of the REE: although one stood out, a large positive anomaly in the abundance of Iridium (Ir) in the clay. Figure: Reproduction of the graph presented by the Alvarez's in 1980. Ir is relatively abundant in meteorites. The isotopic composition of Ir in the clay represents that of a meteorite and not the crust. They also found chromium isotopes which had similar composition as carbonaceous chondrites. The clay layer was dated to be 65Ma and it corresponded to the extinction of animals which were observed in the sedimentary. The Alvarez pinned the cause of the extinction on the meteorite impact. This theory came to be known as the "Alvarez hypothesis". Figure: (Left) Map showing the location of the Chicxulub crater. 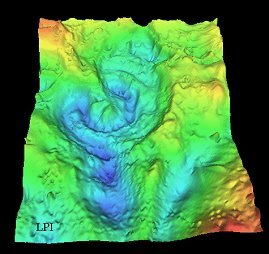 (Right) A 3-D gravity model of the crater. Since the crater is not a surficial feature, it was discovered using seismic studies and geophysical methods (such as gravity and magnetic) which probed deep into the subsurface. There was one thing missing from the "Alvarez hypothesis": an impact crater or site. The Alvarez's had shown that the meteorite had to be 10km in diameter which would have created a ~150-200km wide crater. The Alvarez had failed to find any craters that would have matched the age or the size. Ten years later, Alan K. Hildebrand and Glen Penfield found it. 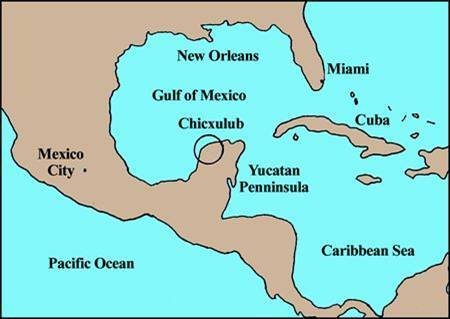 They discovered the Chicxulub crater site in the Yucatan Peninsula and dated it to be around 65 Ma. The discovery of the impact site, along with debris in the sedimentary record in North America, provided the proverbial "smoking gun" and much needed credibility to the "Alvarez hypothesis."